I don't have a VR setup yet. Ultimately, it boils down to buying the hardware, and I just don't have $800 laying around to drop on a Vive. I did manage to pick up a copy of ADR1FT in one of the latest Humble Bundle's though, and it's one of the games I've most wanted VR for. 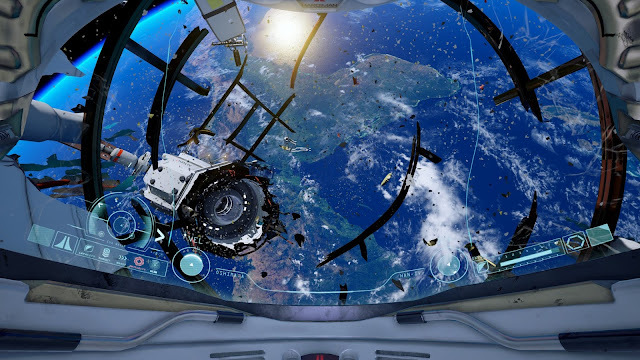 A game about surviving in space after a catastrophic event, I was pleased to find ADR1FT to be plenty enjoyable outside of VR. ADR1FT casts players as Commander Oshima, part of a crew aboard some sort of orbital station that produces materials for use on Earth. You awake to a crippled and heavily damaged station and your oxygen supply running dangerously low. From there, it's up to you to survive and find out what happened to the station and its missing crew members. The story itself is fairly interesting, delivered through radio snippets, found personal logs and crew communications. Large parts of the game are fairly quiet save for the sound of the character breathing in the EVA suit, so hearing the voice of another crew member or a transmission from the surface really stands out and grabs your attention. I think the greatest downside to the approach to the story is that because it relies so much on finding collectibles, a player not interested in such things might only get the barest version of the story. I missed only three of the objects in the game and still have some questions left unanswered, so please be aware going in that you'll spend a lot of time tracking down small objects to get the whole story. You may still get the gist of it without them, but I feel that without the details of the story, we can't really understand the characters within it as well. I expected ADR1FT to be a real challenge. There are plenty of obstacles along the way, from fast moving debris, to live cables dangling in your path, to large sections of the station that still move. However, the biggest impediment to your progress is your oxygen. The suit uses your stored oxygen to propel itself in one direction or another, meaning that the player is required to move smartly, using momentum and planning trajectories before committing to a move. Most of the movement can be accomplished by moving through various broken sections of the station, but there are a few moments when you travel through fairly open space for a great distance. At first, I felt terrified by these moments. I tried to make sure that my course always took me past an oxygen container or two and made note of every refill station I found. However, as the game wore on, I became far more confident with my movement. I discovered that a great deal of the movement can be accomplished without ever running the risk of running out of oxygen. It seriously lowered the stakes for me and made me feel a bit cheap. Sure, the scenery was beautiful, but in those moments when I was floating free of the station should have been equal parts terror and awe. Instead, many felt uniform and unexciting. 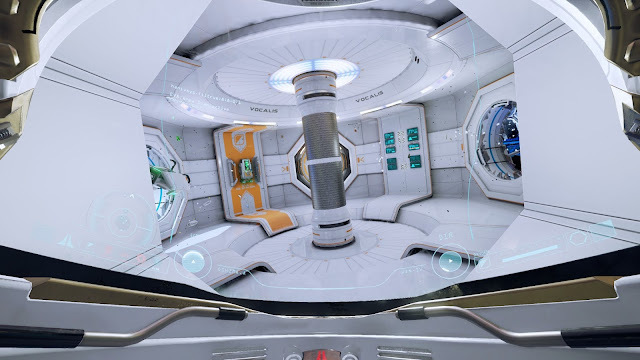 ADR1FT is beautiful. I saw the Earth turn, watching day turn to night, cities light up the coasts. I saw the sun reflected off the oceans. Even the sterile, mostly white interiors of the game are beautiful in their own way. Moving about and exploring the remains of the station was the best part of the ADR1FT. The occasional (and largely classical) score interludes become the emotional high points of the game. Being isolated so far above the earth, the sound of a piano playing Debussy's Claire de Lune is mesmerizing and surreal. Had this been all that ADR1FT was, I would be content just to float out there with those notes in my helmet. 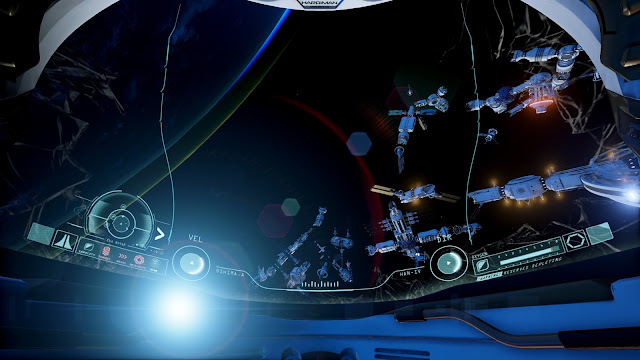 I can't say for sure if ADR1FT is more challenging in VR, but from my experience with VR, I imagine that it is probably a lot more disorienting. Not really having a set "up" is a real trip, so I can only imagine what several hours of it might be like. 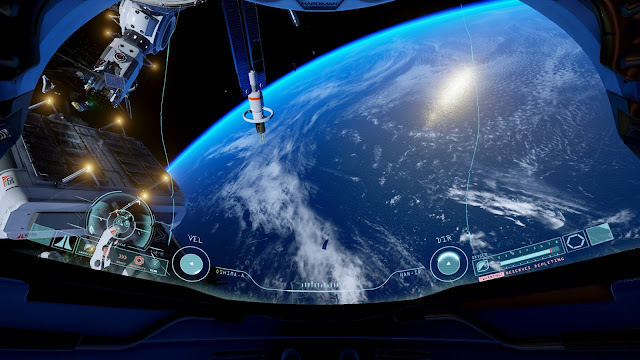 For all of my gripes with the gameplay, I did still enjoy ADR1FT, though as more of an experience than a game. While I had a goal throughout the game, most of the time, I didn't feel any particular urgency to meet that goal, nor did I feel particularly impeded by anything between that goal and myself. If you are interested in ADR1FT, I recommend keeping this in mind. Take time to appreciate your surroundings, there's plenty of axygen to go around.